Yellow used to be my favorite color. Growing up I had yellow walls. 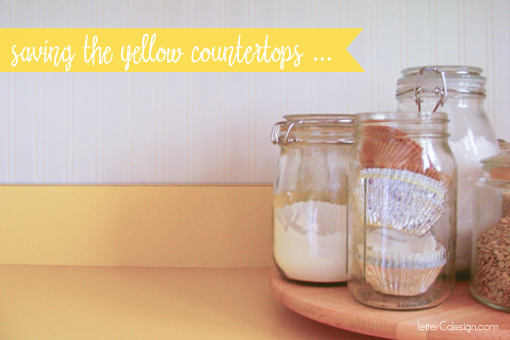 But the yellow countertops in my kitchen looked dated and out of place. Turns out the wallpaper was the problem. It was dark blue and had little baskets full of flowers all over it. White paint was the answer (I think it always is). Underneath the blue wallpaper there was another layer of wallpaper – an orange and gold diamond pattern – and that wallpaper was not going anywhere. On the walls above the counters there was a laminate that had specs of orange and yellow in it. Since the laminate didn’t hold paint and the orange wallpaper was not coming down, new wallpaper seemed like the only option. Wallpaper is not my favorite thing. It is a hassle to take down and I think allover pattern is a bit too busy, but I found this beadboard wallpaper that works perfectly. It adds texture to cover up the uneven walls and is paintable so if I ever want to change the white it won’t be a problem. To make the yellow countertops look like part of a plan I bought these photos. The countertops now look fresh and brighten up the dark kitchen. Now if I can just find a way to save the beat up floor.